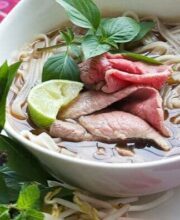 In a bowl, toss the chicken meat with the soy sauce and cornstarch. In a separate bowl, whisk together the ingredients for the sweet and sour sauce. Heat a wok or saute pan over high heat. Swirl in just 1 tablespoon of the cooking oil. When hot, add in the marinated chicken. Spread chicken out all over the surface of wok in single layer. Let cook for 2 minutes, undisturbed, until browned. Flip chicken pieces and brown the other side, about 1 minute. Chicken should be browned but still uncooked in the middle. Remove chicken from wok and set aside. Keep the wok on stove and turn the heat to medium-high. Swirl in the remaining cooking oil. When hot, add the onions and stir fry for 1 minute. Add in the cherries, red and yellow bell peppers. Stir fry for 2 minutes, until the bell peppers are cooked, but still colorful and crunchy. 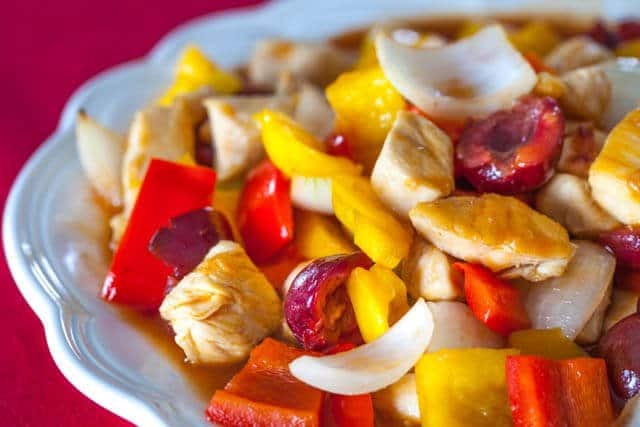 Add the partially cooked chicken back into the wok and pour in the sweet and sour sauce. Bring to a simmer and cook an additional minute, or until the chicken is fully cooked through. Careful not to overcook the chicken! I loved your Sweet &Sour chicken with cherries. I now have to wait for cherries to arrive in Québec. I wonder if you have a récipé for crispy lemon chicken? Jaden, I am loving exploring your beautiful website! I am living in Guangzhou, and made this dish tonight with our ‘ayi’s’ help. 🙂 The whole family really enjoyed it. Thank you for sharing your excellent work with the world! 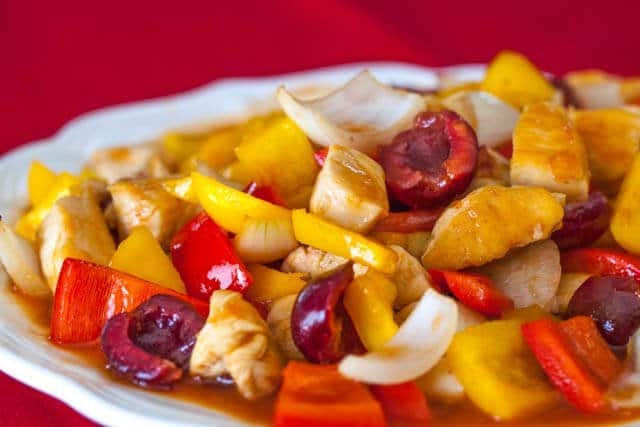 Pingback: Sweet and Sour Chicken with Cherries | Delicious recipes featured here. This food makes my appetite bigger, looks very pleasant and so colourful. Very keen to make it for my own. Sweet cherries would be perfect for this recipe. I love your website. ;). I am on a strict diet so I can’t really eat a lot throughout the week, but I cook on Sundays. Inspirational! Could you send the company name and website where you got that wonderful table? I remember that it was in Eastern Canada and you did a write-up on it. Wow! 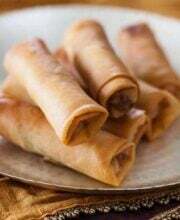 What a delicious and easy recipe. I just watched the video and can’t stop staring at it. Bookmarked it. 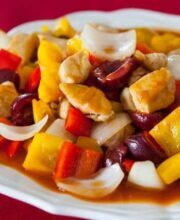 Never thought to use cherries in sweet sour chicken. But now you just inspired me. Thanks for sharing, Jaden! 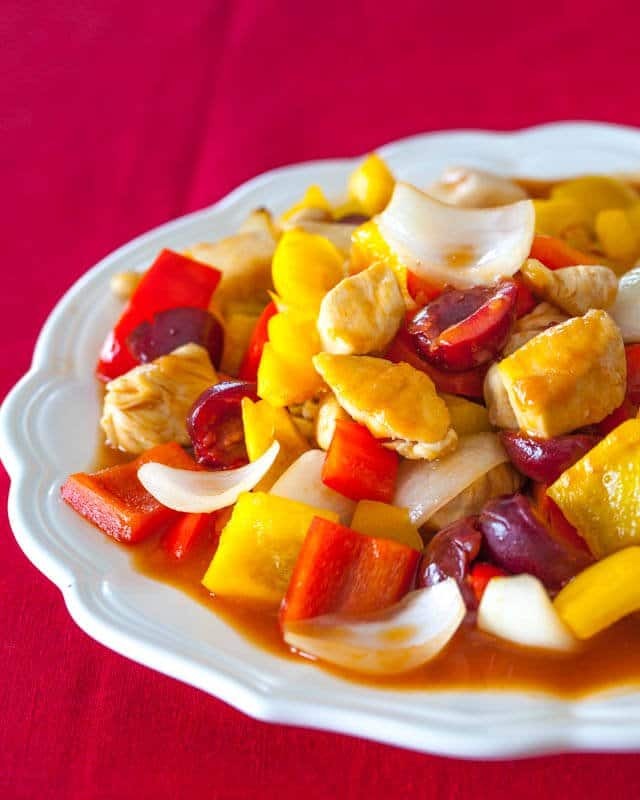 Pingback: Sweet and Sour Chicken with Cherries | Easiest recipes in the world! I love this new spin on Sweet and Sour Chicken. Must attempt this one day.